What is your favorite meal of the day? I am pretty sure mine is brunch; and I am always in search for yummy brunch ideas. 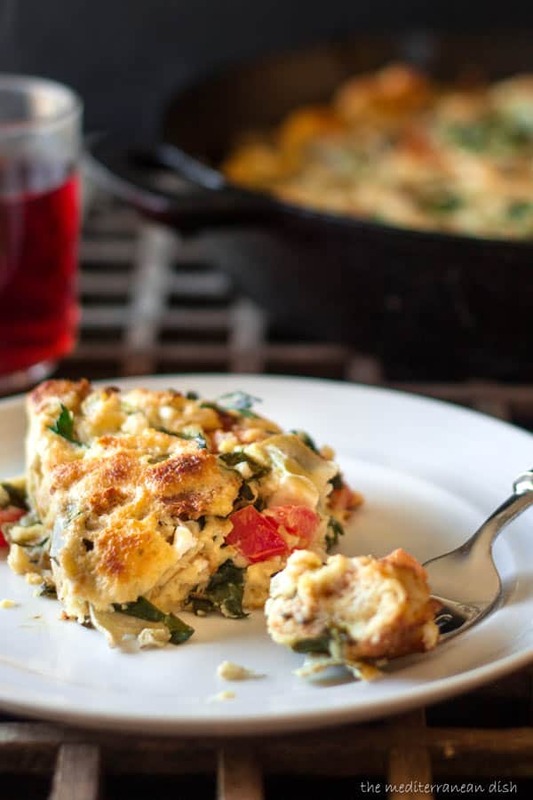 Today, I have a quick and delicious egg casserole recipe that I’m excited to share with you. There is something about skipping the line at the local diner and making your own brunch, right? Eggs, just the way each family member likes them; bottomless coffee; and I get to stay in sweats all morning. 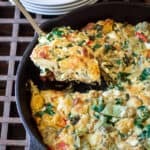 Sundays brunch at my house often feature this Mediterranean-style, easy egg casserole! 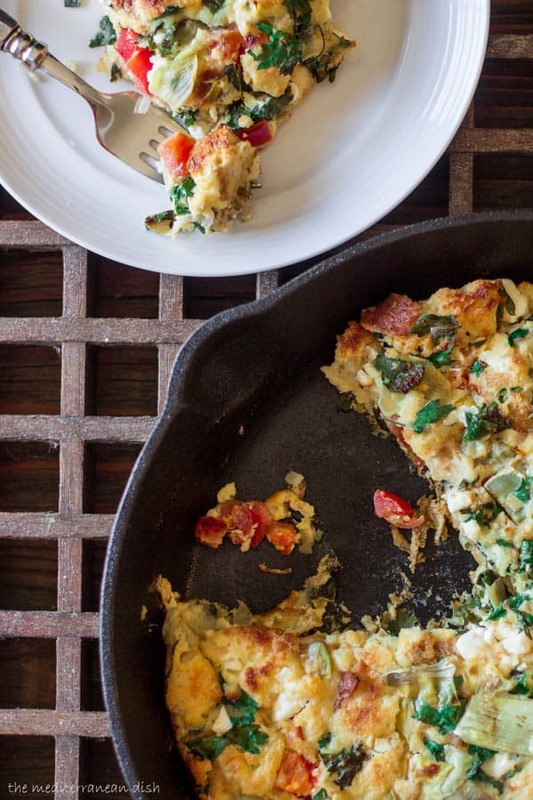 In my opinion, an egg casserole like this is meant to help you use up what you already have on hand. 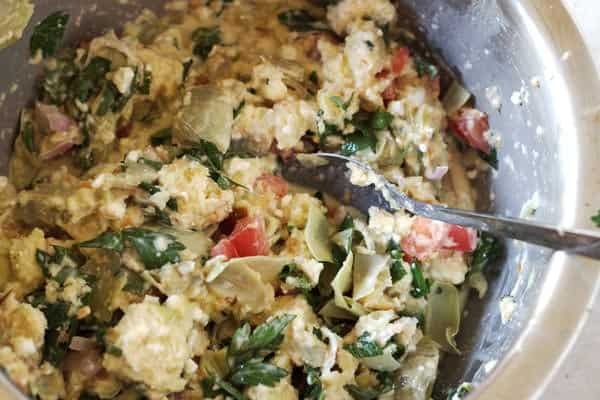 You can really make this egg casserole your own by changing up some of the ingredients. 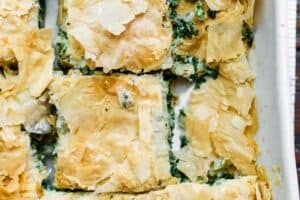 I chose to keep it vegetarian, adding artichokes, tomatoes, shallots, feta, and two of my favorite fresh herbs, parsley and mint. If I had olives, I would have added them for a little Greek. Prepare artichokes (I microwaved mine according to package). Chop tomato, shallot, parsley, mint leaves. 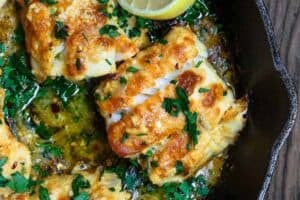 Prepare some feta and ground Parmesan. Set aside. Take six slices of fresh toast and cut them each into 1/2-inch pieces. Place in a large bowl and set aside. 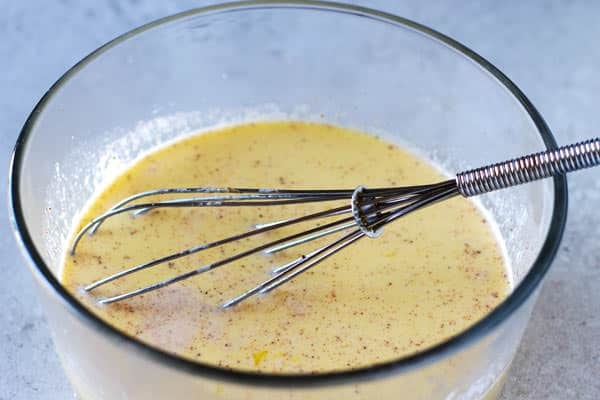 In a separate bowl, whisk together milk, eggs, baking powder, nutmeg, hot paprika, salt and pepper. Pour milk-egg mixture into the bread bowl. Now mix in the vegetables, herbs and cheese you prepared earlier. 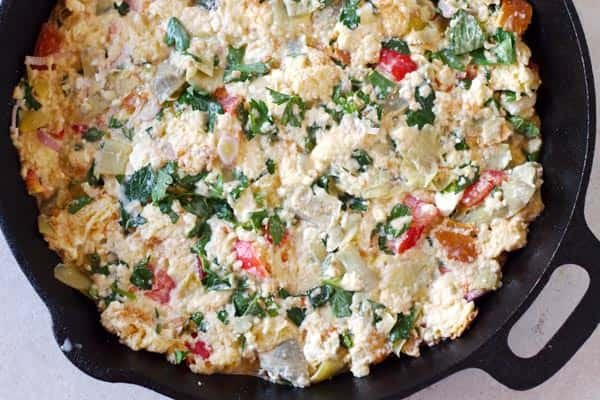 Combine everything together and then transfer to a lightly oiled cast-iron skillet or oven-safe baking dish. Bake in 375 degree F-heated oven for 35 minutes or until cooked through. Enjoy! You might also like the Shakshuka recipe; a warm bed of tomato and green bell peppers topped with sunny-side-up eggs! 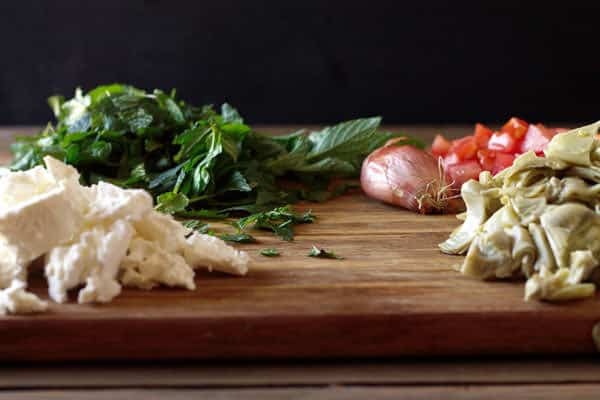 Prepare artichokes, chopped tomato, chopped shallot, parsley, mint leaves, feta and ground Parmesan. Set aside. Pour milk-egg mixture into the bread bowl. Now mix in the vegetables, herbs and cheese prepared earlier. 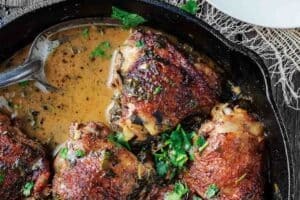 When all the ingredients are well-combined, transfer in a lightly oiled cast-iron skillet or oven-safe baking dish. 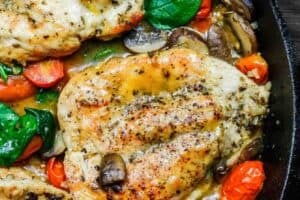 Could you include nutrition data in your recipes? Hi Barbara, most of our new recipes do include this data. We are working our way back to older recipes and will be adding it soon. Made this per the instructions and it came out great. I would reduce the mint a bit the next time (personal preference) but tasted great! Thanks so much, Drew! Glad this turned out well for you! You often refer to your ft followers as the USA. What about us Canadians to? All followers are important to me here, Craig. This happens to be Thanksgiving week here in the USA and so some of the activity here happens to highlight that. And I’m assuming you might have read our giveaway post or looked at our discount at the store, at this point, we are only able to offer those opportunities to our USA audience (we have some restrictions we must follow.) I hope this explains, and I’m so glad to have you here. This sounds like what I’m looking for. Any reason pieces can’t be frozen? 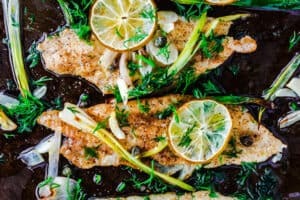 I’d also like to enjoy these for a lite lunch or quick dinner. You can freeze portions to be used later, Sheryl. Thaw overnight in fridge. Made this in order to evaluate it for a dish a an upcoming wedding shower. After the four of us had tasted and evaluated it, we decided we needn’t look further. This was an awesome dish! We made it just as the recipe was. For the toasted bread, we used English muffin bread. Wonderful, John! So glad to hear it! Have you ever done this without the bread/toast? Trying to go low carb. Maybe I’m crazy, but when I went to your recipe for the Middle Eastern Zucchini Baked Omelet, the ingredient list does have soaked bread in it. 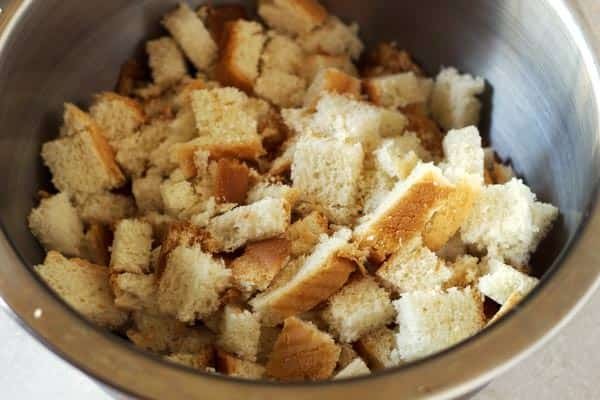 Have you made that particular recipe before without using the bread? Like the previous comment, my family is eating low carb/no wheat so bread cannot be used in our recipes. Great, Bayla! I hope you’ve subscribed to join our e-mail list. 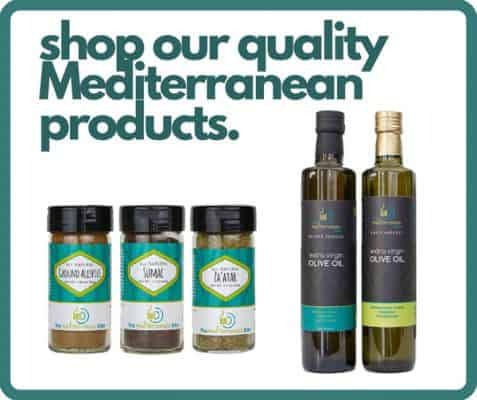 We post new Mediterranean recipes weekly. Can this be set the night before? And, can I double this without messing up the outcome?? Lisa, great questions! Although I have not made it overnight, I think it will work nicely to put it all together, cover tightly and refrigerate. I have also done the prep the night before and covered my veggies etc. in its own bowl…cut up the bread and sealed it in a bag…that is most of the work really. The next day, I put it in the baking dish with the egg-milk mixture and bake. Just another way to do the overnight thing. Yes, you can double this recipe easily…double everything and use two separate baking dishes…you are making two of the same recipe then. I am eager to hear how it goes. Thank you for stopping in! Yummy- I look forward to Sunday Brunch all week long! Suzy Karadsheh this looks fabulous! FYI you left out the egg measurement. Thanks, Kristin! How funny to leave out the main ingredient:-) I’ll fix that. just printed the recipe, def will next week! I love a lazy brunch, often sitting outside watching the boats go by. 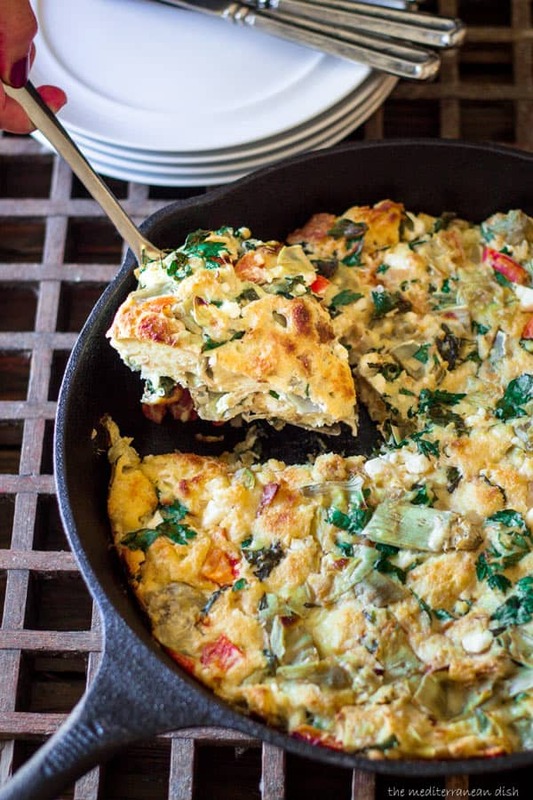 I’d enjoy it more with a wonderful breakfast casserole like this. Ah watching the boats go by sounds so nice, Maureen! No boats where I live, just snow right now. Love your sweet comments. Hugs.